If you are entering a fantasy hockey playoff pool for the first time, or an annual office pool you need to approach choosing your players in a much different manner than you would for a regular season pool. Simply drafting the highest scoring player in each box, or round is a sure fire recipe for failure. To win in the playoffs you need a different strategy and this guide holds the keys to help you reign victorious over the competition. In this guide, we will tell you who our four predictions to be in the conference finals are plus our favorite to be a dark horse. Every year there seems to be one Cinderella team that defies the odds and plays beyond the first round or two, even go all the way. In addition to that we will highlight each team’s fantasy depth chart and top ten fantasy players. To check out the FREE Playoff Guide, simply CLICK HERE. SAMPLE: Viktor Stalberg (CHI – LW) – The University of Vermont standout has reached career highs this season with 19 goals and 21 assists as a member of the Blackhawks. Unfortunately, he has not recorded even one point on the powerplay. Stalberg is playing a regular shift next to Patrick Sharp while seeing more than fifteen-minutes a night for seven of his last eight. If Crawford can find his game and Keith can stay out of trouble, he’ll be one of those guys that’ll push the envelope every night of the week until the middle of June. SAMPLE: The Boston Bruins will win because they are the defending Stanley Cup Champions. That makes them the team to beat. The roster saw little turnover from the championship season the year before, and many of the players have only matured such as Tyler Seguin, Brad Marchand, and Milan Lucic who are all still under 25 years old. The core of the forwards is in their prime with Patrice Bergeron, Nathan Horton, and David Krejci all between 25 and 30. The backbone of the team is Norris Trophy contender Zdeno Chara and Vezina and Conn Smythe winner Tim Thomas, who are playing at an elite level. SAMPLE: The Chicago Blackhawks will lose because goaltending has been a bit of an issue this season with Corey Crawford and Ray Emery splitting time and both looking someone mediocre during stretches of the season. Crawford however didn’t look awful last year, and the Blackhawks were almost able to get past the Western Conference Champion Vancouver Canucks with him in net. The recent concussion of Toews after a car accident, which saw him crash into an L-Train beam, is a major concern for this young Blackhawks team. Without Toews the Blackhawks could be dead to rights, but Toews is a warrior on the ice and is expected to be ready to go by the time the playoffs roll around. 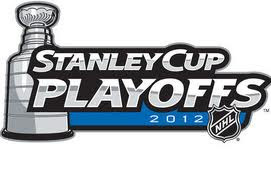 Think you know who is going to win the Stanley Cup this year then join the 2012 FHC Playoff Hockey pool and prove it. Not only are bragging rights up for grab but the winner also receives a replica Taylor Hall Edmonton Oilers jersey. Free to enter. Click here for more details http://www.fantasyhockeycoach.com/forumdisplay.php?57-2012-FHC-Playoff-Pool. Posted by pharling at 2:50 p.m.